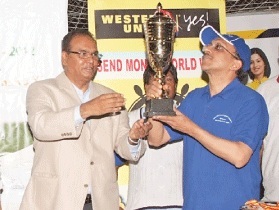 receiving the trophy from Chief Guest Aftab Patel. Muscat: Rahim made a blistering 21 and claimed one wicket to help the Ambassador’s XI register a 20-run win and with it a hattrick of wins against Indian Social Club Chairman’s XI in the Republic Day cricket. The Natural Stone Veteran’s Cup organized by Ahli-Sidab Gulf Cricket Academy supported by ISC Bhojpuri Wing was held at the academy ground. Winning the toss Ambassador XI led by the Indian Ambassador J.S. Mukul himself piled on the runs to score 95 runs for the loss of eight wickets off their quota of 12 overs. Opening batsman Chauhan and J. S. Mukul added seven runs for the opening partnership and later Prasad along with Chauhan added 17 runs for the third wicket. Other batsmen who made useful contributions were Rawat 11 runs (7 balls), Jacob Varghese with 9 runs (8 balls). Suhail Khan (2 for 3) was the main wicket-taker and was ably supported by Dr Satish Nambiar, Waheed, Paras P., Karanjeet and C.M. Sardar who finished with a wicket a piece. ISC Chairman’s XI facing a daunting total set by the Ambassador XI were restricted to 75 runs for the loss of seven wickets in the stipulated 12 overs. Osama Rawat 13 (7 balls), A. Hameed 12 (7 balls, 2 fours), Nitin 11 (11 balls), Parsi 11 (15 balls) and Mr. Extras 22 runs contributed to the total. Brief scores: Ambassador XI 95 for the loss of 8 wickets off 12 overs (Rahim 21 not out, Rawat 11, Jacob Varghese 9; Suhail Khan 2/3) defeated ISC Chairman’s XI 75 for the loss of seven wickets (Osama Rawat 13,A Hameed 12, Nitin 11, Parsi 11; Calvin Bearder 2/5, Jacob 1/7, Rawat 1/7). Chief guest Aftab Patel, CEO of Al Omaniya Financial Services (SAOG) ,along with Guest of Honour Mohammed Rafiq, CEO Mohammed Rafiq and Partners Co. LLC and Mohammed Mahmood, GM, Al Hashar Tourism and Travels LLC, Alamgir Abduljaleel, co-convenor, ISC Bhojpuri Wing, handed over the trophies to the winners, runners-up. The individual awards were handed over by Mohammed Mahmood to the man of the match Rahim of Ambassador’s XI, the best bowler award was won by Suhail Khan of ISC Chairman’s XI, the best Fielder award went to Mohammed Irshad of Ambassador’s XI and the best all-rounder was won by Calvin Bearder. The tournament was sponsored by Natural Stone LLC, Asia Express Exchange (Lulu Group), Blue Line International Restaurant, Jet Airways, Al Zaam Group, Purshottam Kanji Exchange, Western Union, Al Hashar Tourism and Travels, Mohammed Rafiq and Partners, Unique Contracting, Nagori LLC, Passage to India, Al Nafeesa Jewellers, Al Warha Asian Food, Ashar Hiral Textiles, Arabian Textiles, Kaleem Group of Companies and Oasis Water.